I'm really looking forward to being a small group leader at this retreat in March! I hope you'll be able to come too, and I would love to meet you there. Several widows I know attended last year and spoke very highly of it, and I've personally met the hostess and founder, Gayle Roper, and she's a wonderful Christ follower. This is, in fact the only Christian widow's retreat that I know of currently. It's at a great Christian retreat center within an hour of Philadelphia. I highly recommend it! Events like this can be turning points on your own widow's journey. Please pray about it and come. Click the link below for more info. and at any point in their journey. 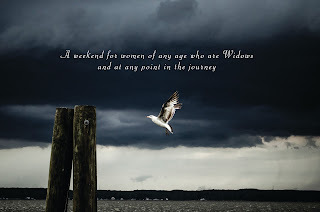 Spend a weekend with other women who have lost their husbands to death. You will be with people who understand your journey. Come share your heart and your hurt and be encouraged as we remind ourselves that, hard as it is, our God is able. Learn from women who are where you are, women who have weathered grief and difficult times. During small group discussions, individuals will have the opportunity to briefly share the stories of their own widowhood and glean helpful tips from the experiences of others. Encouragement, smiles and tissues provided! If you are not a widow and attending in support, please understand that the small groups are for Widows only. Click here for registration and information.